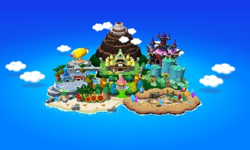 Pi'illo Island (formerly known as Pi'illo Kingdom) is a location in Mario & Luigi: Dream Team and the main setting of the game. It is the home of the ancient race known as the Pi'illos and is where Mario, Luigi, Peach, the Toads and Starlow are invited to go on vacation. 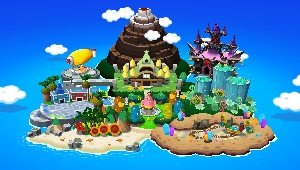 As with Beanbean Kingdom, all of the areas are named after the theme of the area, except they are all puns on terms of sleep instead of types of laughter. The island's name itself is a homophone of "pillow". In the past, an ancient species called Pi'illos used to live on this island. They have the power to travel in and out of the Dream World, and they are the guardians of the Dream and Dark Stones, two spiral-shaped rocks formed from dreams and can grant wishes. However one day, the bat king, Antasma, stole the Dark Stone to fulfill his wishes. To prevent this, The Pi'illos battled him and managed to seal him in the Dream World, but before he is sealed Antasma shattered the stolen Dark Stone; the broken pieces became Nightmare Chunks and fell all over the island, petrified evey single Pi'illo, turning their bodies into stone, and trapped their souls in these Chunks located in the Dream World. Makurano-Tō From まくら Makura, meaning "Pillow", and 島 Tō, meaning "Island". German La Dormita Italian for "the sleep"
Ostrov Zasypayya From Засыпать, meaning To fall asleep and Ostrov meaning island. Begaero Seom Begae(-)ro, literally means 'to the pillow', and Seom means an island. This page was last edited on November 21, 2018, at 14:30.